The Great Lakes region of the United States includes the states of Wisconsin, Michigan, Indiana, Ohio, Illinois, Pennsylvania, and New York. The region enjoys four distinct seasons. Although the climate is considered temperate, temperatures in the summer can exceed 100°F and can drop to –10°F in the winter. There is rich farm land, and farmers' markets offer abundant produce and fruit in the late summer and early fall across the region. The region is also home to much manufacturing activity. Industrial pollution threatened the health of the Great Lakes, especially Lake Erie (the smallest Great Lake), until the 1960s, when a growing awareness of environmental concerns led to increased government regulation. Acid-rain, believed to be caused by air pollution generated by the coal-fired utility plants in the region, is also a concern. Increased acidity in the lakes creates unhealthy conditions for fish and other living things in the ecosystem of the region. French and Indian War (1754–1763), the Revolutionary War (1775–1783), and the War of 1812 resulted in the British and French controlling the northern side of the Great Lakes (what is now Canada), and the United States controlling the south. The American Indians who remained were settled on reservations. 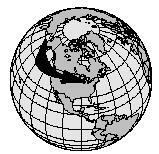 During the 1800s and 1900s, waves of immigration to the Great Lakes area came from Germany, Scandinavia, Holland, and Poland. Most were farmers who were attracted by the cheap, fertile land. The Homestead Act of 1862 offered free acreage to anyone who agreed to farm it for a certain number of years. The close-knit, family-based communities that developed retained their ethnic character for generations, cooking their traditional foods adapted to local ingredients. The population of the Great Lakes region continues to be largely German, Scandinavian, Dutch, and Polish. A number of miners originally from Cornwall, England, also migrated to the area. The Detroit-Dearborn metropolitan area in Michigan now boasts the largest Arab American population in the United States—the city of Detroit being the prinicpal port of entry in the United States for Arab immigrants. The Arab Americans in Michigan-have contributed some foods of the Middle East, such as hummus, to the "menu" of the Great Lakes region. Place the wild rice, water, and 1 teaspoon of the salt in a saucepan and bring to a boil over medium heat. Reduce the heat to low and simmer, uncovered, until all the water is absorbed. Meanwhile, brown the bacon in a large skillet. Remove the bacon from the skillet and drain it on paper towels. Save the bacon drippings from the skillet. Pour the eggs into a mixing bowl and add ½ teaspoon of the salt and the pepper. Pour the eggs into the skillet where the bacon was browned, and brown the eggs lightly. Turn them over gently and brown on the other side. When the eggs are firm, cut them into narrow strips. Lightly toss the bacon, egg strips, chives, bacon drippings (plus melted butter or margarine to make ⅓ cup) with the cooked rice. 4 pounds fish fillets, such as lake trout, salmon, whitefish, pike, etc. Put water in large pot, add salt, and bring to a boil. Add potatoes and onions and cook until half done, about 8 to 10 minutes. Put fish steaks in a wire basket, or colander or wrap them in cheesecloth and tie into a bundle, and lower them into the pot until they are entirely covered. Return to a boil and cover the pot. Boil until the fish is firm but tender, about 8 to 10 minutes. Remove fish and vegetables and drain both thoroughly. Heap fish on a platter surrounded by the potatoes and onions. Pour melted butter or margarine over all, sprinkle with chopped parsley and pepper, and serve with lemon wedges. Wild rice is harvested in Wisconsin. 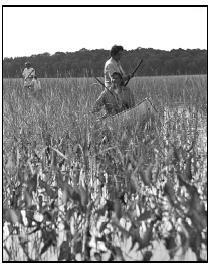 The Great Lakes region was originally populated by American Indians who taught later European settlers how to hunt the local game, fish, and gather wild rice and maple syrup, as well as how to grow and eat corn and native squashes and beans. The European immigrants, mostly from Germany, Scandinavia, Holland, Poland, and Cornwall, England, each shared their traditional dishes with the rest of America. The Germans contributed frankfurters (hot dogs), hamburgers, sauerkraut, potato salad, noodles, bratwurst, liverwurst, and pretzels to the American diet. Scandinavian foods include lefse (potato flatbread), limpa (rye bread), lutefisk (dried cod soaked in lye), and Swedish meatballs, as well as the smorgasbord (a table laid out with several courses of small foods). The Polish introduced kielbasa (a type of sausage) , pierogies (a type of stuffed pasta), Polish dill pickles, and babka (an egg cake). Pancakes are a Dutch contribution, along with waffles, doughnuts, cookies, and coleslaw. Miners from Cornwall brought their Cornish pasties, and small meat pies that were easily carried for lunch. Later immigrants from Arab countries settled in Detroit, Michigan, and introduced America to foods like hummus (puréed chickpeas), felafel (deep-fried bean cakes), and tabbouleh (bulgur wheat salad). Dairy is a major industry in the Great Lakes region, particularly Wisconsin, known as "America's Dairyland." Dairy farmers in Wisconsin milk about 2 million cows every day, and there is one cow for every two people in the state. Not surprisingly, milk, butter, and cheese are staples in the Great Lakes diet. Pigs are also common on farms in the Great Lakes region because they take up less space and are easier to raise than beef cattle. Pork, therefore, is another common ingredient in Great Lakes cooking, especially in the form of sausage. Beat the eggs to a froth in another mixing bowl. Add milk and salt, stirring slowly. Pour the egg and milk mixture into the flour and mix well. Pour a thin layer of the batter onto a hot buttered griddle or frying pan. Turn over when bottom is brown and cook other side. Serve hot, rolled up with butter or margarine and brown sugar. Boil potatoes in a large pot, until tender when poked with a fork, about 25 minutes. While potatoes are still warm, peel and slice into ¼-inch slices. Put the sliced potatoes in a large bowl, add chopped onion, cider vinegar, and oil. Stir gently, making sure not to break up the potatoes. Add about ⅓ cup of the dissolved beef bouillon, toss lightly, then add the chives and salt and pepper to taste. Toss lightly to coat potatoes. Spray a 1-quart baking dish with cooking spray. Fill a large saucepan half full of water and bring to a boil. Add the macaroni to the boiling water. Cook until the macaroni is done, about 7 to 10 minutes. Drain macaroni in a colander, then return it to the saucepan and set aside. In another large saucepan, melt the butter or margarine on low heat. Whisk in the flour and cook until the mixture is bubbly, about 3 minutes. Slowly add the milk to the pan and stir with a wooden spoon, turning heat up to medium. Cook until mixture thickens then remove from heat. Add the cheddar cheese, Swiss cheese, and salt to the pan and stir until cheese melts. Add the cheese sauce to the macaroni and mix well, coating the macaroni with the sauce. Place the macaroni and cheese into the baking dish and sprinkle the top with crushed croutons or cornflakes. for 25 to 30 minutes. Combine chickpeas, tahini , garlic, canned chickpea liquid, and lemon juice in a food processor or blender and pureé to a smooth paste. Thin with more liquid from the canned chickpeas, if necessary. Mix olive oil with a bit of paprika to make it red and drizzle it on top of the hummus. A Great Lakes food that has become popular over all the United States is Buffalo chicken wings. There are three stories told as to how wings became famous, but perhaps the most believable is that in 1964 the Anchor Bar in Buffalo, New York, received a shipment of wings by mistake. The owner, who had been asked to supply a "meaty" appetizer for a gathering at the bar, cooked up the wings in hot sauce and served them with the house dressing, which just happened to be bleu cheese. Melt butter in the microwave or in a small saucepan. Stir in hot sauce. Rinse chicken wings and pat dry. Arrange wings in a single layer on a cookie sheet. Pour butter–hot sauce over wings. Bake for 1 hour. Serve while hot with bleu cheese dressing and celery sticks. Serves 8 to 12 as a snack. Most people who live around the Great Lakes are Christian, with small minorities of Muslims and Jews in certain areas. German Christians brought with them many of the Christmas traditions Americans now take for granted, such as Christmas trees and Santa Claus (or Kris Kringle). They also introduced America to New Year's Eve celebrations. Another German cultural festival that has become popular in America is Oktober-fest. The first Oktoberfest took place in 1810 in Bavaria (a region in southwest Germany) to celebrate the marriage of Crown Prince Ludwig and Therese of Saxon-Hildburghausen. Since then, it has grown into a huge fall festival that celebrates German heritage as well as the fall harvest. The largest Oktoberfest outside of Germany takes place in Cincinnati, Ohio, and many other Oktoberfests are held throughout the Great Lakes region. At all of them, sausage, bratwurst, sauerkraut, and other traditional German foods are served, along with German beer. Norwegian Americans celebrate their cultural heritage on May 17, the day the Norwegian constitution was signed in 1814. Among the traditional Norwegian foods served at these festivities are lutefisk (dried cod soaked in lye) and lefse (potato flat-bread). In a paper bag, shake together 1 cup of flour, the powdered sugar, baking powder, and lemon rind. In a mixing bowl, beat eggs until very light and frothy. Add dry ingredients from the paper bag to the beaten eggs. Beat well. Work in the rest of the flour to make a soft dough. Roll dough out to about ¼-inch thick and cut into 1½-inch by 2-inch rectangles. Lay cookies out on a lightly floured cloth and let set about 2 hours to dry the tops. Bake cookies on greased cookie sheet for 20 minutes or until bottoms are golden. Sauté bacon in a frying pan over medium heat until crisp Remove bacon from pan and drain on paper towels. Save 4 Tablespoons of the fat from the pan and pour the rest off. Add onion to the pan and sauté in the remaining bacon fat until clear. Rinse the sauerkraut, drain well, and stir into the onion. Cover pan and simmer on low for 10 minutes. Add apples, chicken broth, wine, potatoes, vinegar, and sugar. Simmer gently until apples and potatoes are tender but not mushy, about 10 to 20 minutes. Serve with bratwurst for an authentic German meal. Prepare instant mashed potatoes according to the directions on the box. Add butter or margarine and salt, blending well. Add flour, ½ cup at a time, to make a soft dough. Knead dough for about 3 minutes on a lightly floured board or countertop. Heat a griddle or large frying pan over high heat. Bake each lefse, turning once, until golden brown on both sides. The majority of those who live around the Great Lakes are descended from German, Scandinavian, and Dutch farmers who settled there in the 1800s. Farming life shaped the diet and mealtime schedule of the region. Hearty breakfasts and generous lunches gave the farmers the energy to finish their work. German immigrants taught America to serve meals "family-style," with all the food on the table at once, rather than bringing it out to the table in individual servings. Miners from Cornwall, England, had long eaten pasties (PAST-eez), small meat pies that were easy to carry for lunch. Immigrants to the Great Lakes area brought their tradition of Cornish pasties with them, and they are still a popular snack in the area. Germans love beer and started a number of breweries around the Great Lakes. The Pabst and Schlitz breweries were both founded in Milwaukee, Wisconsin, in the 1800s by German Americans. (Milwaukee still ranks as the number-one beer-drinking city in America: While Americans on average drink 6 gallons of beer per year, Milwaukee residents average 42 gallons.) The Great Lakes region is also home to many well-known food companies, including Kellogg's, Kraft, Pillsbury, Green Giant, and Land O' Lakes. Shape into small meatballs and arrange on a baking sheet. Bake in the oven for about 7 minutes. Wearing an oven mitt, carefully shake the baking sheet to prevent the meatballs from sticking. Bake for about 8 more minutes. Prepare pastry according to instruction on package. Combine the ground chuck with the onion, turnip or carrots, and potato. Season with salt and pepper. Roll out the pastry to ¼-inch thickness. Cut it into 6-inch rounds, using a plate or saucer to measure each circle. Lay the rounds on a flat surface and place an equal amount of the steak mixture in the middle of each round into the shape of a small sausage. Brush the rim of each round with a little beaten egg and fold one side over, forming a half-moon shape. Make two small slits on top to allow steam to escape while cooking. Place the pasties on a greased baking sheet and brush the outsides with the remaining beaten egg. Bake for 20 minutes at 400°F. Then reduce the heat to 350°F and bake for another 40 minutes. Pasties may be served as a snack, carried in a lunchbox to be eaten cold, or as a light supper piping hot from the oven. A majority of people from the Great Lakes region receive adequate nutrition. The lakes surrounding the area provide a variety of fish, including walleye, perch, catfish, and bass, that are high in protein and iron. With an abundance of rich soil and farming land, the region produces many different crops, such as wheat, corn, and vegetables. Wisconsin, whose milk and cheese products are rich in calcium, is one of the top dairy-producing states in the United States. Blue, Anthony Dias. America's Kitchen: Traditional & Contemporary Regional Cooking . Atlanta, GA: Turner Publishing, 1995. D'Amico, Joan, and Karen Eich Drummond . The United States Cookbook: Fabulous Foods and Fascinating Facts from All 50 States. New York, NY: John Wiley & Sons, 2000. Dooley, Beth, and Lucia Watson. Savoring the Seasons of the Northern Heartland . The Knopf Cooks American series, no. 14. New York, NY: Knopf, 1994. Fertig, Judith M. Prairie Home Cooking. Boston, MA: Harvard Common Press, 1999. Fussell, Betty. I Hear America Cooking: The Cooks and Recipes of American Regional Cuisine . New York, NY: Penguin Books, 1997. Allrecipes. [Online] Available at http://www.allrecipes.com (accessed April 19, 2001). Finland & Finnish-American Web Resources. 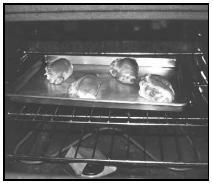 [Online] Available http://alexia.lis.uiuc.edu/~cook/food.htm (accessed April 17, 2001). German American Corner. [Online] Available http://www.germancorner.com (accessed April 17, 2001). Great Lakes Information Network. [Online] Available http://www.great-lakes.net (accessed April 19, 2001). Recipe Source. [Online] Available http://www.recipesource.com (accessed April 19, 2001). ScanSelect. [Online] Available http://www.scanselect.com (accessed April 17, 2001). Sons of Norway. [Online] Available http://www.sofn.com (accessed April 19, 2001). Upper Midwest. [Online] Available http://www.execpc.com/~midwest (accessed April 19, 2001).